Seneca designs and builds every product for Cow Comfort and longevity, maintaining the highest quality and standards in the industry. When you have a product that is made to last for decades, you have to be sure you get it right the first time. To that end, Seneca poured extensive Research and Development into the creation of a new lockup that would represent the ultimate in cow comfort and also suit the needs of our customers; long into the future. In order to bring the Dairy Industry the very best in animal retention, we studied breeding trends and evolving physical characteristics of US dairy cows and listened to our customers to hear what they were looking for in the perfect lockup. The result was the SENECA GEN3 Series Lockup, a heavy duty system packed with quality features that will maximize cow comfort today and provide unrivaled longevity well into the future. The GEN3 Series lockup maximizes comfort with its larger, more inviting head opening. Once at the feed line, your cows will be more at ease with the whisper quiet return of the swing arm, thanks to the oversize rubber silencer on each arm. A heavy duty quick release handle and easy individual lock release will ensure a quick and stress free release, every time! 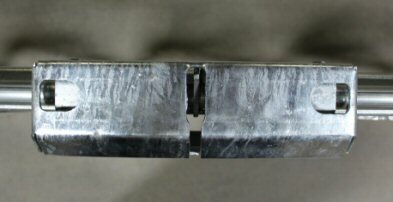 Finally, a reinforcement sleeve on every swing arm will ensure smooth, like-new operation long after our competitor’s swing arms decay and fall off! The GEN3 series truly is the lockup for (long into) the future! Over-sized rubber bumper on every swing arm for whisper quiet return. no-maintenance use on long runs. Individual cow retention lock has no pins. Lock and release mechanisms are fully encapsulated to avoid user injury or accidental animal release. Swing arms are reinforced to ensure decades of use with extremely minimal wear. Curious cows eat comfortably in this locked Standard Heifer GEN3 Series Lockup. The GEN3 Series Lockup comes in 2 models; Standard and XWE, which stands for X-tra Wide Entry. Both the Standard and XWE model frames are fabricated using heavy-duty Hot Dip Galvanized (HDG) 2”x2” 11ga square tubing and HDG 1-1/2” schedule 40 pipe. Both models also enjoy all of the great features listed to the right. The SENECA GEN3 Series Standard Lockup is highly versatile and comes in a large variety of stock lengths. All of our GEN3 Standard Lockups are adjustable so that you have the flexibility to decide which animals go where and when. 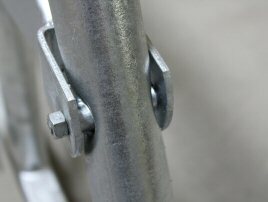 The adjustable bar is held in place with a single pin (left), the same way they are in the Generation 2 Quick Release models. 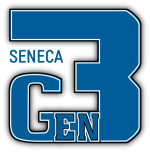 The SENECA GEN3 Series Standard Lockup is available in Calf, Heifer, Cow and Dry Cow. See the Animal Sizing Chart to learn which lockups will best suit your specific needs. The GEN3 - XWE currently comes in two sizes; the XWE Heifer (also called the Bred Heifer lockup) and the XWE Cow lockup. Both styles sport a fixed opening for convenience, as well as all of the other features of the GEN3 Series for added comfort and ultimate longevity. The XWE Heifer lockup was specifically designed for the “Bred Heifer” that has reached 800# and is being bred for the first time. While these animals will fit comfortably in a Standard Cow Lock, their frame is more petite and placing them in Cow Locks would be an inefficient use of space. 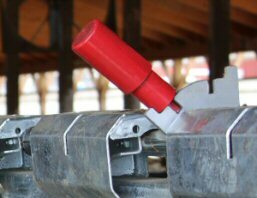 The XWE Heifer Lock spacing allows for a comfortable fit with one additional lock per 10’ or 12’ section. The XWE Cow lockup boasts one of the largest head/neck openings in the industry, coming in at 19½ inches! The XWE was designed for the larger farm with a greater number of 800lb + cows. 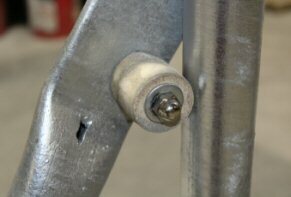 When installing posts to mount lockups, we recommend 3" - 4" between the face of the post and the edge of the curb. Mount lockups with the swing arm facing opposite the feed alley. This will protect lockups against skid steer and feed equipment damage.